Dawn Spencer Hurwitz recently launched several new fall fragrances, and my personal favorite of the bunch is Souvenir de Malmaison, "a new twist on a romantic classic: spicy carnation and rose meet in an ambery, wood fragrance." Souvenir de la Malmaison is a floriental with notes of lemon, bergamot, black pepper, ylang ylang, rose, carnation, jasmine, cinnamon, clove, labdanum, ambergris, sandalwood, cedar, patchouli, tolu balsam and vanilla. I have a weakness for good historical references in perfumery, and this scent has a few. First: Malmaison was the elegant residence of Napoleon Bonaparte and his consort Joséphine de Beauharnais, a château with a legendary rose garden overseen by Joséphine herself. Second: Souvenir de Malmaison is a rose cultivar created in 1843 and named in honor of the rose-loving Empress and her gardens. 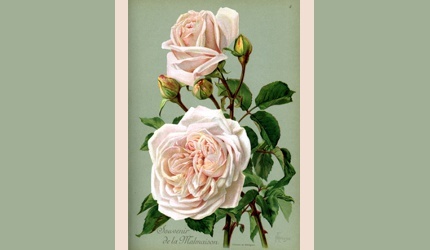 And in a related bit of recent perfume history, as perfume aficionados may wistfully recall, there used to be a carnation fragrance named Floris Malmaison. Souvenir de Malmaison starts off as a complex and androgynous carnation fragrance, with the black pepper and sandalwood notes framing the clove-tinged petals of the flower itself. It's a warm scent, and the resin notes amplify that effect as they emerge. And yes, the rose is there too — it steps in gradually, and it's an elegant rose with just the faintest hint of something naughty from the ylang and ambergris. So, where does Souvenir de Malmaison fall on the spectrum of carnation perfumes? Well, when I told Robin Here at NST™ that I'd like to review it, she immediately asked how it compares to the dearly departed Floris Malmaison. Unfortunately, I can't find any samples of the Floris in my stash; I must have used up my last vial years ago. In my memory, though, Floris Malmaison was a very spicy, almost "Red Hots" take on carnation, heavy on the clove and cinnamon. Souvenir de Malmaison isn't quite that fire-y, nor does it have the incense note and more traditionally masculine style of Aedes de Venustas Oeillet Bengale. On the other hand, it's warmer and more woody than Etro Dianthus or L'Artisan Parfumeur Oeillet Sauvage. I still have a few more samples from Dawn Spencer Hurwitz to test, but I have a feeling that Souvenir de Malmaison will remain my new favorite. I'm planning to purchase a small bottle soon, as a self-reward for meeting some upcoming deadlines. While I'm wearing it this winter, I can dream of summertime rose gardens, or read about the Empress Joséphine, or just feel beautiful. Dawn Spencer Hurwitz Souvenir de Malmaison is available in a variety of sizes and formats. For buying information, see the listing for Dawn Spencer Hurwitz under Perfume Houses. Note: top image is Souvenir de la Malmaison, illustration by Hermann Friese from Julius Hoffmann's The Amateur Gardener's Rose Book, 1905 [color frame added] via Rosegathering. Oh, this sounds so nice. Dawn does carnations so nicely, too – Fleuriste and Oeillets Rouges (which *is* a spicy one) are gorgeous. And dang, I could have asked for a sample of Souvenir de Malmaison when I recently ordered a little spray of Giverny in Bloom. I asked for Reveries de Paris instead, which I haven’t tried but am sure will be lovely. My decant of the Floris is long gone as well. Oeillets Rouges was actually a little *too* spicy for my taste — that’s one red-hot carnation! I like Fleuriste — cool carnations in a florist’s display case. But this one is even more “me”! Thanks for the review, Jessica, I think I need to order a sample. Well, I’m not going to stand in your way. But it really is lovely, and so long-lasting! Lovely review Jessica. I’ll have to order some samples soon. I’m not able to stop you. If you do, I hope you’ll enjoy them!! Sounds lovely – hope to try this! I have several DSH perfumes and really love them. Can’t keep up with the new releases, though, especially with special projects such as the ones to accompany museum shows. She is prolific!! I’m not up to date on all her releases — I still have other recent ones to try, plus most of the “Chroma” collection. But now I’m stuck on this one, so I’ve slowed down!! Great review. I am definitely intrigued. I and a friend did a side by side of this with Floris Malmaison. They’re really quite different. The Floris is actually both greener and drier. It’s not at all ambery. The DSH is warmer and sweeter, with an ambery/woody base. My friend (a hard-core perfumista with a great nose) actually preferred the DSH. But I wouldn’t recommend that someone who is looking to replace Floris Malmaison should choose this. This is really helpful to know. Thanks, SE! Wonderful review Jessica! I like carnation so this goes on the sample list. Do you have other DSH perfumes you liked? You’re welcome! Let’s see…she has *so* much to try, but a few of my favorites are Beach Roses (salty green roses), American Beauty (a true rose soliflore), Snow (powdery angel’s wing musk), Winter White, Kaleidescope, Albino, Fleuriste (a florist-shop carnation), Cimabue… so many! !